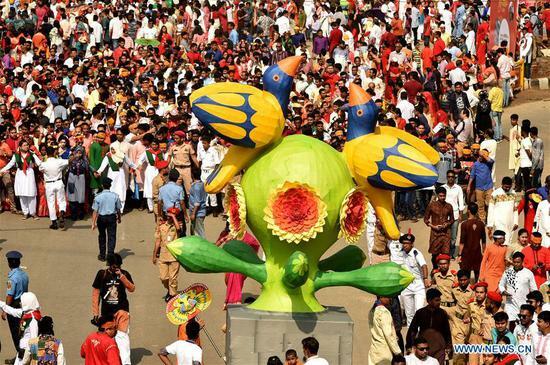 DHAKA, April 14 (Xinhua) -- With a combination of traditional and modern ritual practices, people in Bangladesh Sunday celebrated the Bengali New Year 1426. Like in previous years, people in Dhaka raising masks and wearing traditional costumes joined the colorful procession - the Mangal Shobha Jatra - to welcome the New Year with good spirits on Sunday morning. This year's procession was the 30th that students of Dhaka University have coordinated to welcome the Bengali New Year. The students carried large symbolic figures of birds and animals during the procession. In Bangladesh, Pohela Boishakh, or the first day of the New Year, is a national holiday. Bengalis usually start the day with the traditional simple breakfast of panta-bhat (leftover rice soaked in water) and fried hilsa fish. Boishakhi Fairs are organized in many parts of Dhaka and elsewhere in the country. The lifestyle of rural Bengal is showcased in these fairs which also stage traditional folk songs and plays. Mughal Emperor Akbar introduced the Bengali calendar year and the celebration of Pohela Boishakh, marking the advent of Bengali New Year, which is now considered an integral part of Bengali's cultural heritage and tradition. The Mughal Dynasty ruled most of the Indian subcontinent for about three centuries starting 1526. The Bengali New Year coincides with the mid-April New Year in Cambodia and a number of countries in the Indian subcontinent.